Grey skies and a damp track made a washout of today’s first practice sessions for the Grand Prix of San Marino with only a few riders taking to the track. Yamaha Factory Racing rider Ben Spies covered just six laps in the morning session and four in the afternoon. The Texan’s efforts were simply to test the track conditions as no valuable data could be gained for Sunday’s race which is forecast for sunshine. Team mate Jorge Lorenzo decided to stay inside today, conserving valuable kilometres of engine life and again wisely choosing to avoid any unnecessary risks to gain little valuable set up data. 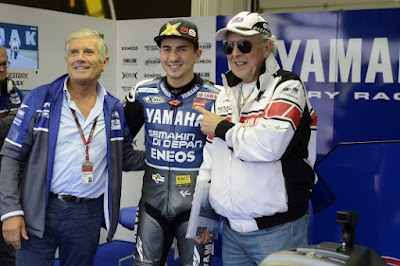 An otherwise dull day was brightened by not just one but two MotoGP legends from Yamaha’s racing past arriving in the garage to chat with the riders. 15 time World Championship winner Giacomo Agostini was the first to appear, soon followed by Yamaha’s first ever world title holder Phil Read.